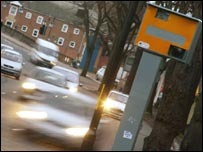 Two British motorists who took their legal fight against speed cameras to Europe have lost their case. Idris Francis, of Petersfield, Hants, and Gerard O'Halloran, from London, argued that current rules forced car owners to incriminate themselves. They said human rights were breached by making a car's owner name the driver if the vehicle is caught speeding. But judges at the European Court of Human Rights in Strasbourg voted 15 to two to reject their argument. "In my view it is a perverse decision," Mr Francis said. "I am shocked and amazed." Both men had separately claimed a right to silence after their cars were caught speeding. Company director Mr Francis refused to say who was behind the wheel of his vehicle as it was photographed doing 47mph in a 30mph zone. He was fined and had three points put on his licence. Mr O'Halloran had said he was driving his vehicle but later retracted, saying he had a right to silence and protection from self-incrimination. Magistrates fined him and added penalty points. The men took their case to the European court last September with the support of human rights group Liberty. Judges acknowledged that both men had faced compulsion to provide information, but threw out their claim that the right to remain silent and the right not to incriminate oneself are "absolute rights". Their judgement noted that people "who choose to keep and drive cars" have implicitly "accepted certain responsibilities" under UK law. This includes an obligation to name the driver of a vehicle after a road traffic offence has been committed. The judges also pointed out that UK law made it clear that no offence has been committed if a car owner can prove that he or she did not know, and could not be expected to know, who was driving the vehicle. Mr Francis said after the verdict: "The fight for freedom goes on. We can't allow the tyrants, who are taking away our rights, to succeed. They have to be stopped."